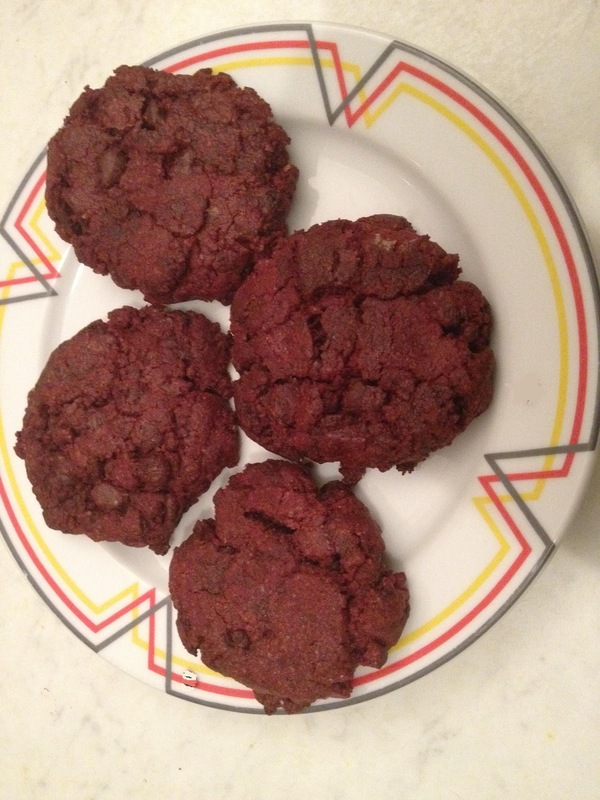 Red velvet chocolate chip cookies, they look more maroon in reality and for some reason the pic refused to rotate! I’m so excited as I type this post that I’m making more typos than usual. I have discovered an amazing recipe for Red Velvet Chocolate Chip Cookies, I didn’t even know such a heavenly dessert existed until now, I feel cheated. How could I have not discovered this recipe sooner? As I’m a fan of both Red Velvet Cupcakes/Cakes and Chocolate Chip Cookies, I guess it was only a matter of time I would stumble across this culinary masterpiece! I like baking things from scratch as I can taste the preservatives in box mixes (I can I swear) and its definitely the healthier option. Indulgently rich they will be gone before you know it. Leave butter outside to soften, this is essential if its hard or melted the butter will mess up the batter. Cream butter and sugars together until fluffy in the bowl of an electric mixer. Add egg and vanilla and combine until smooth. Beat in red food coloring. Be careful with this step as it can get a bit messy if the colouring spills on your fingers or counter top- mine turned out darker because I used a bit more than 1 tsp of food colouring. Stir in cocoa, flour, baking soda and salt until just combined, scraping down the sides when needed. Using an ice cream scoop, scoop out 1-2 tablespoons of dough and set on baking sheet. You may want to flatten the mounds a little for a cleaner shape. Enjoy with a hot beverage of your choice! Milk, tea or coffee. Don’t curse me when it ruins you attempts to watch your weight. This is a wickedly indulgent treat :-). OMG thank you for sharing this!! !